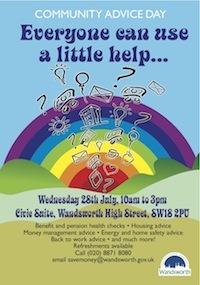 The council is again running a Community Advice Day in the Civic Suite on Wandsworth High Street. The day sees a range of people from within the council, other public sector organisations and charities come together to provide information and advice to local residents. Much of the focus this year is on income maximisation and ways to save you money as well as ensure that you are getting any benefits to which you are entitled. The event is, of course, free and open from 10:00 until 15:00 today.